Design Notes: Straight-up. No chaser. By now you’ve had the chance to see Nightwraith’s recap from PAX, and some of you have pointed out that “off topic” posts like this aren’t technically “design notes”. As creative people we draw inspiration from all sources- and events like conventions are great arenas for us to meet up with other creative individuals and share our ideas. This is part of the creative process and isn’t to be discouraged. To steal from Neil Gaiman, creative people are people too and life is a GOOD thing for us. It’s where we draw our inspiration. So forgive the occasional con recap, piece of prose, or other post that isn’t a list of what’s going into the update, no chaser. Last week, we announced the mid-level packages. 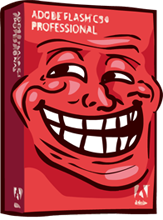 Well, with the transfer to CS5, we weren’t able to implement those promo packs just quite yet. Starting Friday, players will be able to purchase varium with Veteran Battlegear or Advanced Battlegear. As an aside: these are additional promotional items, the current promos will still be available. This enables players to mix and match varium quantities or bonus credits with promo items, and we hope to give players more options in the future! As you recall from last week’s missions, the bunnies have been building a spacecraft to get off of Delta V and back to the planet of their ancestors: Orychtolagus, where Rabbits are the dominant species. See Mr. Cottontail in the Barrens to find out how their scheme all turned out! I realize I wasn’t as kind to the lower levels with the mission chains at Myxoma and Lepus this time around, but never fear! The missions are staying in for a little while to allow you guys time to catch up! Now that we have narrowed down our list to a handful of qualified Mod finalists, it is time to formally close the application process. Thank you to everyone who applied! It is truly thrilling that so many of you care deeply enough about EpicDuel to want to devote your time and energy to helping us, but, sadly, we cannot pick everyone. To our finalists, we thank you for bearing with us during this process and we will get back to you shortly! Silas took the opportunity to investigate his surroundings. Everything was clean, cold antiseptic white. The long table appeared to have been carved from the room itself, or formed naturally like formations in a cave. The wall opposite their entranceway was made completely of glass, and the view from Alydriah’s spire showed several districts of Fortune City, and as the twin suns were rising over the horizon, the shadow of the mine tower fell over the land. “Commander Hitchens is not a red herring, I assure you.” They turned to see Descarl at the door. Her black hair was pulled up in a bun high on her head, and she was wearing the Shadow Guard dress uniform in white, indicating her status as an Administrator. On her lapel, next to the rows and rows of medals indicating her military successes, was a pin with a large Roman numeral I- Administrator 1. A deafening silence fell over the three of them, until it was broken by the butler’s entrance. Tune in to AQW at 4:00PM EST today for week 5 of the AE Artist livestream! This week features Thyton! Just like last time, players should send their suggestions via the AQW forums and join the live draw map to watch the creation of a new item, and get some pro tips on art! Not to be outdone, this Sunday at 9:00 AM EST the EpicDuel developers will be hosting our own livestream at the EpicDuel Artists livestream. If you’ve tuned in to one before, you know that we’ll be answering questions, talking about the game/our inspirations, and apparently I’m required to sing every 10 viewers. So if you want to hear us ramble on about things we find interesting, tune in Sunday! We'll try to keep this to under 2 hours this time, so be sure to get in as soon as you can! Can’t make it to the livestream? The recordings will be hosted there as well! "Welcome Home!" 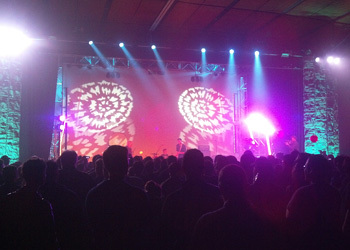 That was the resounding message of PAX East, or Penny-Arcade Expo, a convention unlike any I have ever attended. 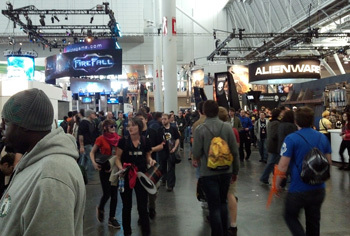 The tone, the overarching "vibe" of PAX, is one of celebration; not of just one genre or style, but of all gaming culture. My three days in attendance were like being at a party with 70,000 friends who get all of your jokes and are also wondering if anybody else saw the man dressed as Chun-Li. I did, PAX. I did. 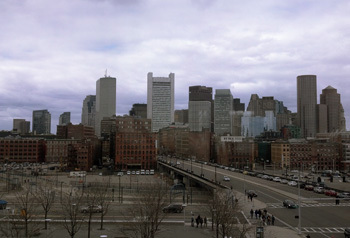 I have never been to Boston, so I was eager to arrive at least a day before the convention to do some urban exploration. 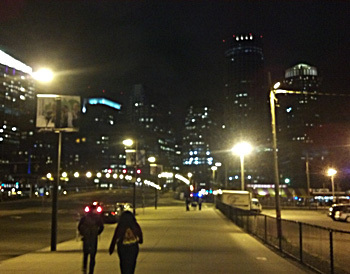 I wish I would have given myself more time because the city is amazing! 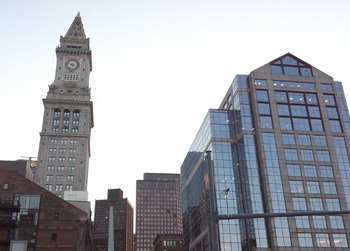 I love the juxtaposition of colonial architecture and modern skyscrapers. 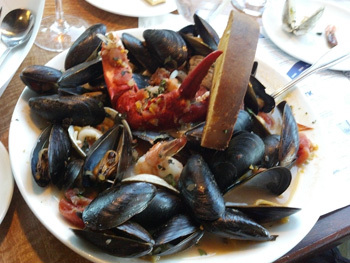 Boston is famous, at least in my mind, for its seafood. I came hungry, and I was not disappointed. I will let this picture speak for itself. 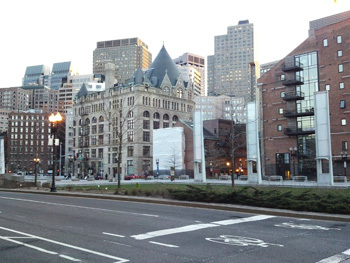 Boston also has the highest concentration of Dunkin' Donuts stores per square mile I have ever seen. I did not know it was possible for a city to have a corporate sponsor, but apparently it is. This is the best idea ever. I cannot even imagine how many tiny bottles of caffeine and B vitamins were consumed over the course of the weekend. At least enough to get to Mars and back. 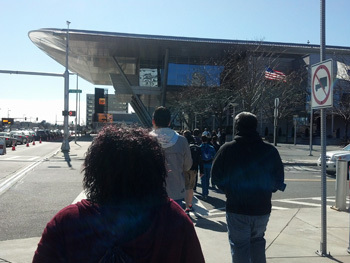 This is the line leading to the Main Theater in the Boston Convention and Expo Center. 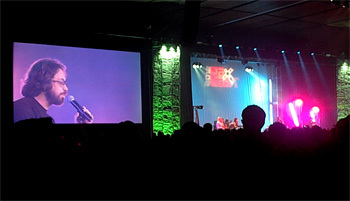 In that theatre, Jordan Mechner, the creator of the platforming classic Prince of Persia delivered a truly inspiring keynote describing his journey from building a game on an Apple II to finding independent success, traveling Europe, handling defeat as his own company failed, and his triumphant return. One point he made really resounded with me – that life is not a resume. Life is a series of challenges, failures, and experiences, and it is not a constant march forward. Game design has progressed so much since its inception, and it is still so very young. It took film over a century to evolve into the medium it is today, but electronic games as we know them have only been around for about thirty years. In that time we have gone from Pong to being able to play full-3D multiplayer games on a device the size of a notepad. Technology and storytelling techniques have intertwined in such provocative ways that the potential of games as a creative medium are nearly limitless. 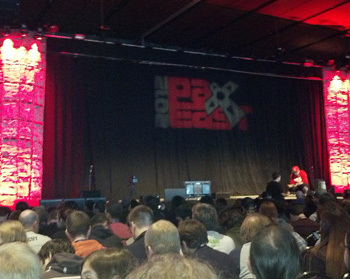 This keynote eloquently set the tone for what would be a first PAX experience to remember. 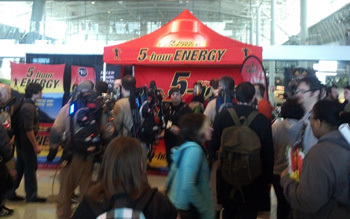 Many conventions reach a point at which they attempt to cater to a wide swath of the population. Often, this is so wide that the original intent of the convention is diluted and the target audience is enveloped in the wave. PAX is 100% about gaming. There are no dealers peddling cheap katanas or bizarre anime DVDs or washed-up 1980s actors selling overpriced signatures (which may be a turn-off for some) but it means that the convention is entirely focused around the goal of celebrating games and gamer culture. 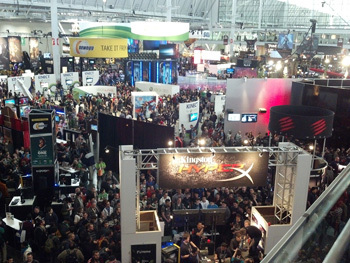 Unlike some other major conventions in the industry like E3, PAX is a more ground-level view of gaming. 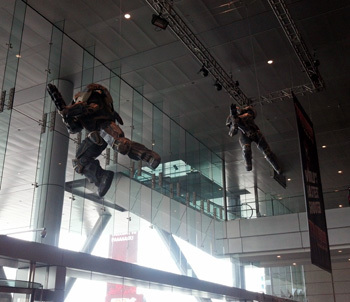 It was a convention designed by and for gamers, meaning there is minimal corporate nonsense. The focus is not on the spectacle of big publishers trying to outspend each other trying to overhype products, but convention attendees playing and discussing their favorite games while having an opportunity to test drive the latest and greatest upcoming products. 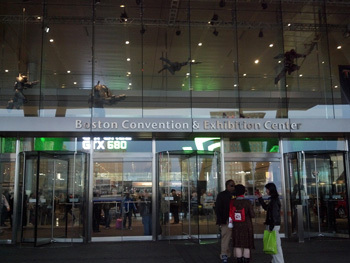 Typical convention fixtures such as "Booth Babes" are discouraged as the convention organizers feel they are degrading to women and detract from the games themselves. This helps cultivate a much more comfortable convention experience. 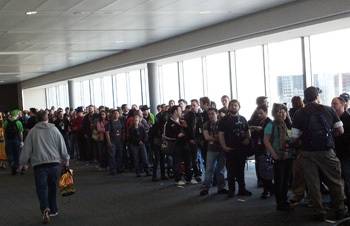 PAX is also an amazing venue for independent developers. Many of their modest booths reminded me of the booth Titan and I constructed in Ohio while attending small, local conventions with extremely rough versions of the EpicDuel (one-shot Supercharge, anyone?) available for the attendees to try. It was exciting to think of the possibilities of an Artix Entertainment megabooth sitting next to Square-Enix and Microsoft, but that might be a bit ambitious for a first outing. I tried to attend as many panels as possible, but not nearly as many as I planned. Some were funny, while others were funny, informative, and inspiring. The best was an impromptu panel in which two of the three panelists dropped out at the last minute, so the sole panelist picked several people from the audience to fill in. It ended up being one of the most random, yet informative panels at the convention. Of all the panels attended, not one felt like a waste, and it would be truly amazing to see an Artix Entertainment panel at PAX. It's worth mentioning that just about anything can happen at one of these panel. During the first Q&A panel, the panelist were surround by Aperture Labs scientists, a lightsaber duel broke out, and everyone witnessed a very sweet marriage proposal complete with a poem about the couple's shared experiences with gaming. That was all within an hour! This is a great time for the little guy. It has never been easier for independent developers to enter the market, with services like Steam and the App store making even the most humble games accessible to the masses. If you want to break into the industry, make a game. Now. This is simple yet challenging advice was echoed throughout many of the panel discussions with veteran developers. If you fail, make a better game. However, in order to be successful you will need to make sacrifices, and often those sacrifices come from your social life. You have the infinite expanse of the internet at your disposal for a knowledge base, so there is no excuse for not having enough information to begin. Handheld game systems are a common sight at any PAX, but this year it was impossible to ignore the prevalence of tablets, specifically, the iPad. Indie developers were shaming the major studios across the expo floor with polished mobile efforts that were easily worth their modest price tags. See game. Try game. Buy game. I marveled at the ease with which interested gamers would see a game, play it for a bit, and purchase the App within a ten minute window. This seemed like a huge advantage over traditional distribution models as many games at the show were either not ready to purchase, or were only available through traditional retail channels. Budding developers and small studios would be wise to take advantage of this new trend in gaming because crowded as it may be, it is full of unprecedented opportunity and possibility. EpicDuel for tablets, anyone? The game industry is a community and all companies and gamers are intrinsically linked. No company can survive the vacuum that comes from ignoring industry trends or consumer needs. The history of gaming is littered with companies that have failed to think progressively. Want to succeed in the gaming industry? Make friends with other developers, make games that nobody else is making, and pour your entire being into your work. In the words of Wayne Gretzky, "A good hockey player plays where the puck is. A great hockey player plays where the puck is going to be." Video Game Orchestra, Supercommuter, The Minibosses, The Protomen, AdventureQuest Worlds musical guests Paul and Storm and Jonathan Coulton, and many more! I could describe the crowd becoming a vibrating mass of frenetic energy and rockitude, but that only does so much. Watching Paul and Storm urging an army of 4000 nerds to take over a 7-11 or a rock opera interpretation of classic games performed with a full orchestra is just a "you had to be there" experience. I shall do my best with pictures. 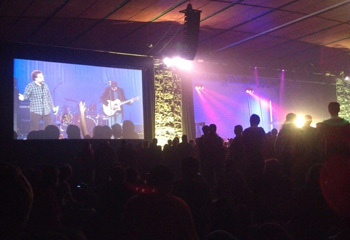 For those unfamiliar with the concept, the Omegathon is the centerpiece gaming tournament of PAX. 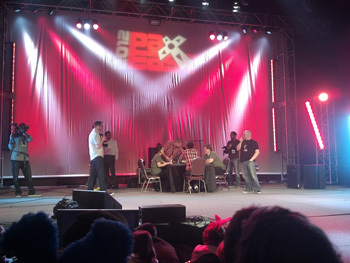 Throughout four rounds, the competitors known as Omeganauts battle each other in games ranging from the latest console titles to ancient board games. The final round is always super secret and the prize becomes more epic each year. This year the final four Omeganauts took center stage in the Main Theatre to wage war across a freshly waxed Crokinole board for an all expenses paid trip to Gamescom in Germany. The loser was destroyed. Not really. 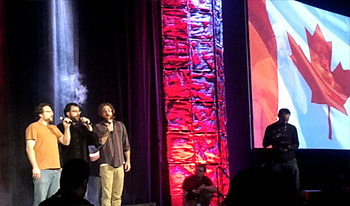 Oh yeah, and we were also treated to Paul and Storm and Jonathan Coulton singing the Canadian national anthem. That happened. I teared up. With a final applause and the drop of the microphone, PAX ended. 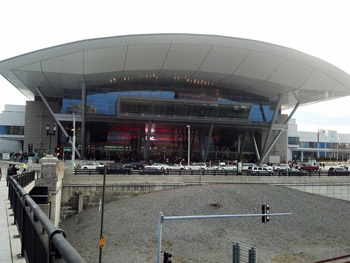 The ground rumbled, the air thickened, and the Boston Convention and Expo Center collapsed in on itself like the house from Poltergeist. The flight back to Tampa was a long sad one, but I arrived safe, inspired and ready to dive back into the business of making games. This is an exciting industry to be a part of, and if PAX was any indication, it will get even more exciting in the near future. First things first: welcome back Nightwraith! 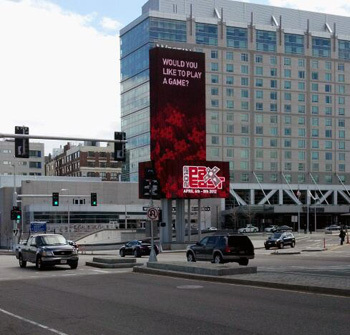 For those not in the know, our creative lead was away at PAX East over Easter weekend. He got back safely so we can all bother him to tell us all about PAX. Will he do a recap? I dunno. That's up to him. Don't worry. I've written enough to punish him for having too much fun. We are finally moving the game to CS5. For realsies this week. If all goes well, you guys won't notice a thing! Maybe a reduction in lag, and better performance with Flash Player 11. For us it means enormous changes and vast potential for implementing all the cool features we've had to put off until we upgraded. Some of you might be wondering why we didn't just use CS5 all along. Well, at the time EpicDuel was first being developed CS3 was new, and it was impossible to forsee it's limitations. This happens all the time in software development, but it was an extremely valuable lesson to learn and formidable challenge to overcome. 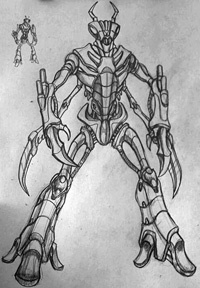 Hopefully, we can wrangle Titan into giving us more details in the next EpicDuel Q & A. Last week we also rolled out quite a few backend things. For example, you can now hit shift while you click to add or subtract 5 points from a skill. Armors got a little cheaper, and you can now buy misc or mission items with a full inventory. RabbleFroth is planning a nerf for Tech Mages. What is it? I dunno, nobody tells me anything. Watch here for details. I am sorry to report that these new packs will be delayed by another week. This week was very trying with all the CS5 testing, so we were unable to implement and thoroughly test the new packages. We really wanted to get this in, but it's not something that can be rushed out. Again, I apologize for the inconvenience. This week we will be adding new items to packs at different price tiers and different levels. This should increase the usefulness of promo items for our players who wish to upgrade but have not yet reached the level cap. 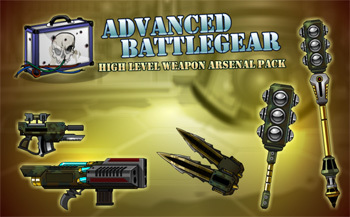 In case you are wondering, the Bionic Battlegear will remain as promotional package for the time being. 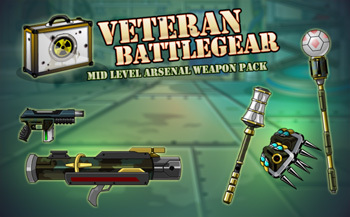 The new packs will include sets of brand-new weapons that can asist players who are having trouble climbing the ranks or finding just the right set of gear for their level. Behold! These new packs will also give us more flexibility for players to mix and match Varium quanities with promotional items, and will allow us to give players more exciting options for packaged gear in the future. We will be continuing the Bionic Battalion saga by accompanying Myxoma and the others on their mission to save little Lepus. While in the Biodome, the bunnies will discover the secrets of their origin. What else will the rabbits uncover in the Archives? Two points I want to address. 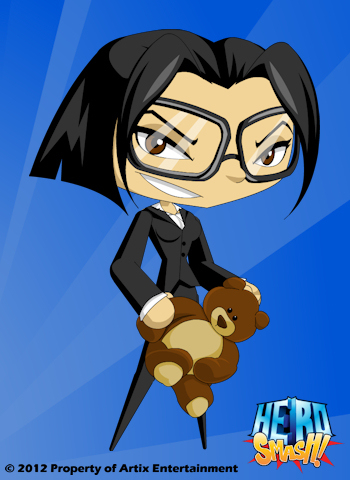 Yes, I'm helping out with words on HeroSmash, but I am not leaving EpicDuel, as I know many of you were concerned. Also, if you are a fan of EpicDuel on Facebook, you are now able to send me a direct message. I don't care if you use it to send reports, ask why you were banned, or things of that nature. However, if you have an account issue, payment issue, want to ask for free things/varium or send me death threats, please don't. Account issues must be dealt with by the help team (thru the help link on portal.Battleon.com) and I am not authorized to deal with master account issues. I also cannot give you free varium. Even if I wanted to. Threats, it should go without saying, are unwelcome and can lead to bans or worse if they're serious enough. Wednesday Livestream at 4pm with Mido! 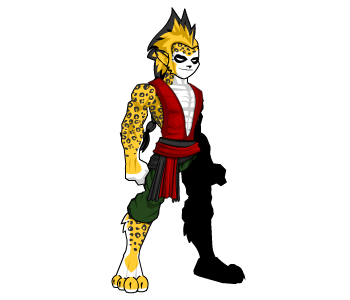 Mido comes to AQW! If you've played through Etherstorm, you'll have met him already. If you have only played EpicDuel, we can only assure you that he is an awesome artist and now you get to see his incredible art skills in action! This Wednesday at 4PM server time, log in to AQWorlds and /join stream to see Mido take YOUR suggestions and turn them into an awesome in-game item (AQW that is)! Kraggor and her people are based on real life animals called Megachillidae: the family that includes mason bees and leafcutter bees. While Kraggor's people are eusocial, many megachillids are solitary, including the creatures which serve as Kraggor's visual reference: the orchard mason bee. This shiny bluish purple bee will find a natural hole or opening in which to build her nest, and she protects her babies by building a house out of mud bricks. They are gentle, industrious bees and rarely sting. They are cosmopolitan across North America, and are efficient pollinators, keeping the pollen on the underside of theory abdomen rather than on their legs like honeybees. They do not produce honey, feeding their young with pollen. Nightwraith here, delivering you some delectable design notes on this week's EpicDuel release. The ED crew is short-staffed at the moment, as I will be attending PAX East, the premiere gaming convention on the East coast and hopefully having more fun than a barrel full of fun while absorbing secret learnings from the game industry's best and brightest. Expect incessant tweets from me about various awesome things throughout the weekend! Titan is wading knee-deep through the game code, updating it to Flash CS5.5. We've mentioned this happening awhile back, I'm sure, but the game has finally reached the point where CS3 is simply too limited to allow us to make forward process in developing EpicDuel. Titan is quickly moving system by system to get the game to publish in Flashplayer 11, which will (hopefully) mean a smoother gameplay experience for everyone and allow us to gear up to building the new features you guys really care about. As the flow of mod applications has slowed, we've been able to catch up to just about all the potential mod candidates. The process has stalled a bit since I will be out of the lab with questionable internet connectivity until Monday. For those who have received interviews, congratulations on making it that far in the process, and sorry the process has been drawn out as long as it has. Log in today at 4pm server time to AQW to see J6 draw a brand spanking new weapon in-game livestream art event! While you watch, send him suggestions by replying to Alina's Twitter account, @alina_ae! 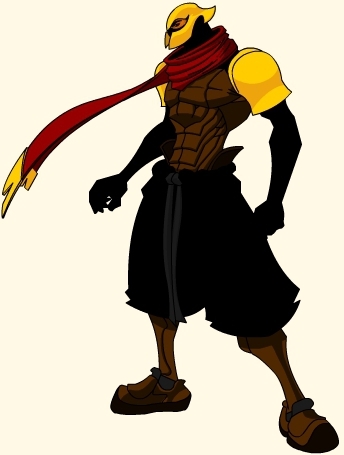 The item will be put into an AQW shop after the event so you can wield what J6 has crafted! Stay tuned in the upcoming weeks to see even more livestream events from AQW artists! EpicDuel will also be streaming on our Epic Livestream Channel throughout the following weeks as we ramp up for a mysterious summer event! Oooooo! A few weeks ago we conducted a Livestream Q&A featuring the entire EpicDuel development staff, and the response was overwhelming. We talked, sung, drew, and answered questions for 3 hours and still didn't get to all of your questions! There was one question in particular that seems to strike a chord with some, and that question was concerning our college education and what recommendations we would make for aspiring game developers seeking to expand their minds. Based on some e-mails we received from concerned players, I am afraid that we may have come off as unsupportive of higher education, but this could not be further from the truth. After all, without college, Titan and Nightwraith never would have met and there would be no EpicDuel. Nearly everyone at AE has some form of higher education, with several having attained or in the process of pursuing advanced degrees. Many of our Moderators are also pursuing degrees. 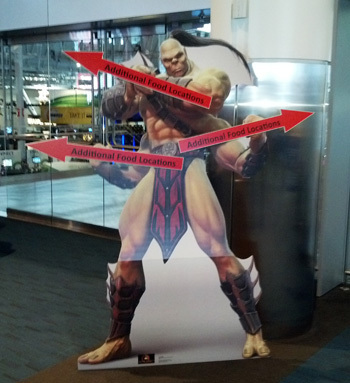 Most positions at major game companies require at least a Bachelor's Degree. What we were attempting to convey in our response to the questions about higher education was a reflection on our own experiences and the value we gleaned from our own respective degree programs. In our experience, college coursework was only a part of a much broader skill set we needed to compile in order to begin work on a project like EpicDuel. Hundreds of hours of outside training and cold experience were needed to get the game's art and code to what it is today. To use a gaming metaphor, if life is an RPG, you will need to do a lot of grinding in addition to the main storyline quests in order to defeat the final boss easily. The fact remains that the video game industry is very competitive, and one cannot rely on coursework alone to secure a job in the field. There are also many for whom college is either inaccessible, or not the best learning environment. We would not want to close the door on game design for those without financial resources or lackluster academic records. While there are some universities that offer specific game design programs, many of these are either very expensive or so specific in their curriculum that switching majors if interests change is nearly impossible. A good college education can be the foundation of a great career, but it is not a guarantee. Again, it was not our intention to steer people away from higher education, and we are sorry if you interpreted our answer as such. The Livestream event was meant to be unscripted and candid, so perhaps we could have measured our responses more carefully and made it more clear that we were speaking only from our own experiences, and not offering blanket advice for everyone in all circumstances. Only human, and all that. Education, like anything in life, will yield the most benefits to those who are actively engaged in its pursuit.